E.M. Magic Swf2Avi FAQs-- How to convert flash to AVCHD? Q. How to convert Flash to AVCHD with E.M. Magic Swf2Avi? 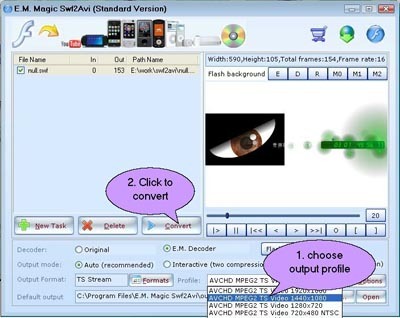 A. E.M. Magic Swf2Avi is the extremely powerful Flash converter software which can convert SWF to AVI and other popular formats. This software is designed to convert swf for your mobile video player as avi, 3gp, mp4, mp3, PSP, PS3, iPod, iPhone, Apple TV, XBOX 360, PS3, Zune etc and also CD, VCD, DVD or Blu-ray player. 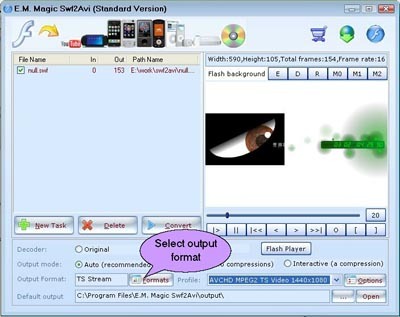 In particularly, E.M. Magic Swf2Avi can help you convert flash to HD (high definition) video formats like HD WMV Video, HD DivX Video, HD Xvid Video, HD H.264 Video, HD Quick Time Video, HD MPEG4 Video, HD MKV Video, HD FLV Video and HD TS Video. What more, it can convert and burn flash to AVCHD which can work on PS3 and Blu-ray player. Here you will learn how to convert flash to AVCHD and Blu-ray with the help of E.M. Magic Swf2Avi. step 1. Add swf files: Click the "New Tasks" button to load what you want to convert. step 2. After adding swf file, click " Formats" and then select AVCHD/Blu-ray format to be converted to. step 3. Click "Options" button and choose an output format in the "Profile" combobox. Then click the "Convert" button to start converting. step 4. After clicking the "Convert" button, the software will convert swf with high speed and top quality.